Full detail is contained in the rehabilitation and information booklet obtainable from Mr Thompson. 1. 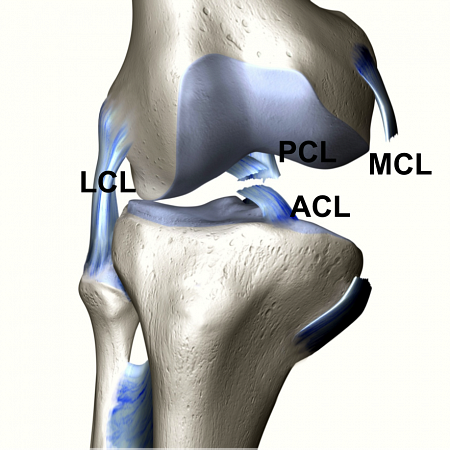 WHAT IS THE ACL ALL ABOUT? Typically, the ACL is injured in a non-contact, twisting movement involving rapid deceleration on the leg, or a sudden change of direction, such as during side stepping, pivoting or landing from a jump (Fig 2). Injuries are often associated with a popping sensation followed by swelling in the knee over the next few hours due to bleeding from the torn ligament. Another of the tests is the Pivot Shift test (Fig), which gently reproduces the giving way sensation as the knee is slowly bent. Done carefully these are painless tests and can accurately diagnose a torn ligament. Often the diagnosis can be made from the story – a pivoting twisting movement associated with a ‘pop’ sensation and the feeling of immediately not trusting the knee. Others nearby may have heard a pop and thought the leg was broken. Early swelling is common and it is not usually possible to carry on playing – and any attempt to do so often results in the knee giving way again. Once these become damaged then there is much higher risk of later problems with the knee such as pain from wear and tear and arthritis. Repeated giving way of the knee is therefore not good for the knee. Several different words are used to describe a torn ACL including “ruptured”, “snapped”, “injured”, “torn” and “popped” for example. Once injured, it can partially heal in some people and this may give sufficient restraint to return to non pivoting sports. In most however, the ligament will not heal tight enough to function for sports involving rapid change of direction. As well as providing a restraint to abnormal knee movement, the ACL gives important information to the muscles involved in the reflex control of knee movements. Nerve fibres give the knee a sense of position and movement and this sensory awareness is known as “proprioception”. It is a normal feature of all joints and helps to give us balance control and confidence in movements. Surgical reconstruction is indicated in individuals who wish to return to pivoting type sports, and for those who have problems with giving way during day-to-day activities. We have previously outlined how repeated giving way of the knee may lead to damage of other structures within the knee and it is this repeated giving way that is bad for the knee. Reducing the repeated giving way can be achieved by either avoiding pivoting activities, using an ACL specific sports brace or by reconstructing the ligament. The decision to undergo reconstruction depends on weighing up all the relevant factors including the degree of instability of the knee and the sporting aims and aspirations of the individual. The ‘keyhole surgery’ operation to reconstruct the ACL involves replacing it with other strong tendons from areas around the knee. Two main grafts are in common use: the Hamstring Tendon graft and the Patella Tendon graft. Both are considered to be equally good and the choice usually depends on the surgeon’s preference. Currently the Hamstring Tendon graft is favoured in most patients and it is probably best to avoid using the patella tendon if there is significant pre-existing pain in the front of the knee, or where employment involves kneeling or squatting. Postoperative rehabilitation is the same for each graft. The hamstring graft is made from the semi-tendonosis and gracilis tendons, which are cord-like structures behind the inner aspect of the knee. These two tendons are taken through a small incision on the front of the tibia and are folded in to make a four, five or six stranded structure (Fig). The patella tendon graft is made from the central strip of the patella tendon that runs from the knee cap (patella) to the tibia; a small piece of bone is kept attached to the ligament at each end (Fig). Bone graft from the tibia is inserted at the end of the operation into the kneecap to restore contour and to help with kneeling. Surgery is performed under general anaesthesia and usually takes 1–1/2 hours. The chosen graft is harvested through small incisions and is prepared into a new ligament. 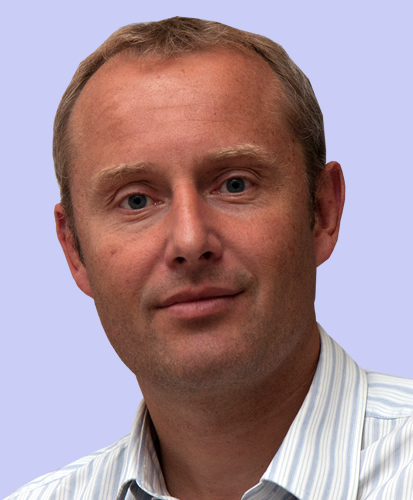 The main part of the procedure is performed via keyhole surgery (arthroscopy). The bulk of the old ACL is removed to allow space for the new graft. 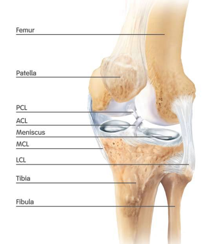 The inside of the knee is prepared and tunnels are made in the tibia and femur at the anatomical site of the attachment points of the old ligament. The new Hamstring Graft ligament is then held in place within the tunnels using a small metal bar (endobutton) on the femur and an absorbable screw at the shin bone end. A Patella Tendon graft is held in place by two bio-absorbable screws which are slowly incorporated by the body. These fixation devices do not usually need to be removed. The aim of the operation is to prevent repeated episodes of giving way or buckling of the knee. Published research shows that approximately 90% of patients consider their knee to function normally, or nearly normally, after surgery. Full contact sport is allowed after rehabilitation but not everyone gets back to his or her previous level. Return to sport depends on the time period since injury and other personal or work factors. It is important to emphasise that the new ligament is not a “normal” ligament. Re-creating stability with the graft is only one aspect of attempting to improve knee function after injury. Other problems such as joint surface damage or meniscal tears may co-exist which can interfere with the joint’s ability to tolerate high loads associated with sport and other arduous activities. Also, the wear-and-tear arthritis associated with ligament injury is not necessarily prevented by reconstruction surgery and the risk of developing osteo-arthritis of the knee in later life is higher once the ligament has been torn. Swelling: Swelling or “effusion” in the knee is usual until up to three months after surgery. The main aim of the first phase of rehabilitation is to reduce swelling. Difficulty kneeling: After any operation on the front part of the knee it takes a while to tolerate kneeling, but with gradual progression through use of a cushion then carpet and finally a hard floor, this usually improves. Bruising: It is usual for bruising to appear down the leg as far as the inner aspect of the heel. It can be surprisingly tender and may take four to six weeks to disappear. Numbness around the knee: Numbness around the scars on the front part of the knee is common as the nerves that supply sensation to the skin crisscross around the front of the knee. This can be quite disconcerting for a few months and some residual area of reduced sensation may persist in the long term. Usually this does not affect the function of the leg. The key to successful rehabilitation is to regain normal, full straightening of the knee as soon as possible, and to control swelling in the early post operative phase before progressing to strength activities. For the first six weeks, until the new graft is well bedded in and healed in place, exercises are performed gently with the aim of regaining normal bending and straightening as the swelling settles. Repetitive cycling of the knee is restricted during the first 6 weeks as this may overload the fixation of the ligament and lead to slippage of the graft and effective lengthening of the new ligament. Pain, heat and increasing swelling in the knee are potentially bad; any of these symptoms can mean that exercises are being overdone. This is unlikely to indicate a serious problem, but these symptoms should be discussed with the physiotherapist. The difference between good and bad pain; after major knee surgery the knee will be sore. It is important to understand that discomfort is normal – particularly when doing some of the stretching exercises. The knee may also ache after an exercise session. This is expected and normal so long as it is not associated with any significant increase in swelling. ‘Bad pain’ is usually sharp and severe in nature. It may be brought on by pushing too hard, and it may be accompanied by an increase in swelling. Activities causing such a problem should be stopped and advice sought from the physiotherapist. Phase 5: Early Sport Training: Months 3 – 6. Rehabilitation begins before surgery in the pre-operative phase to ensure that the individual and their knee are ready for the operation. The aim is to go home comfortable and ready for rehabilitation on the first postoperative day. Sometimes it is possible to go on the day of surgery. The dressings are changed on the 1st postoperative day along with instruction on using crutches the exercises to be performed for the first 2 weeks. Desk work at 3 – 4 weeks * Light manual work at 6 weeks * Heavy manual work (ladder work etc) at 3 – 4 months. The aim of this phase is to regain the range of joint movement and to allow swelling in the knee to settle. The most important aim is to regain normal and full extension (straightening) of the knee. After seeing the physiotherapist on the ward the next appointment is usually one week following surgery to add in extra exercises. The aim of this phase is to work on proprioceptive exercises and to develop light endurance and strength training. This stage is also important for developing core stability to help you progress to full active function. 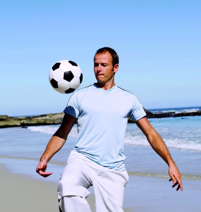 By the end of six weeks your knee should feel normal in activities of daily living. At six weeks the graft will be solidly fixed into bone so that more vigorous strength training can start. Thigh muscle tone and definition (quadriceps / hamstrings) will be hopefully have been maintained during the first post op phase and now the main strength work can begin. Progress is monitored and controlled by the recovery of strength and muscle control. It is important to avoid too rapid progress, as there is a risk of developing overload complications. There is no one solution that fits all individuals great emphasis is given on the care in progressing through this phase back to sport. Supervision by a Physio, sports coach or trainer is key, as is drill and skill acquisition, dependent on individual muscular control patterning in addition to individual relative strength deficits around the hip, knee and ankle. The aim of this phase is to progress sport training and to develop strength and endurance levels to allow return to full sporting activity. This takes time, especially in building up confidence to progress to full contact activities. Return to contact sport is not recommended until strength and functional outcomes are measured at greater than 85% of the normal knee. It should be remembered that the time to regain pre-injury level of skill and performance is very variable but can take 3 – 4 months of training and playing. This confidence can be helped by introducing modified training and specific drills early, often in conjunction with club or team activities. Progress is best achieved in conjunction with a general fitness programme, as this will have reduced over time since the injury and surgery. Full contact sport is, in general, best avoided until able to tolerate a full ­training session with confidence in full fitness and endurance. Detail for various sports are given in the full rehabilitation booklet obtainable from Mr Thompson.